Accompanying His Highness the Amir is a high-ranked Qatari delegation, tasked with the aim of further enhancing the political and economic relations between the two countries. His Highness the Amir and Angela Merkel will address the opening of Qatar-Germany Business and Investment Forum, which will take place on Friday. Rodrigo Duterte arrived in Amman after visiting Israel, continuing a tour aimed at renewing ties with the two countries and checking up on Filipinos in the two countries. 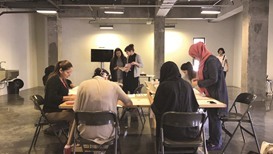 The Fire Station: Artists in Residence on Saturday held a workshop hosted by resident artist Zoe Hawke.